The House has just defeated, in a 323 to 82 whopper, a motion to instruct members of the transportation bill conference committee to slash spending by nearly 30 percent in order to stay within the projected limits of the Highway Trust Fund. 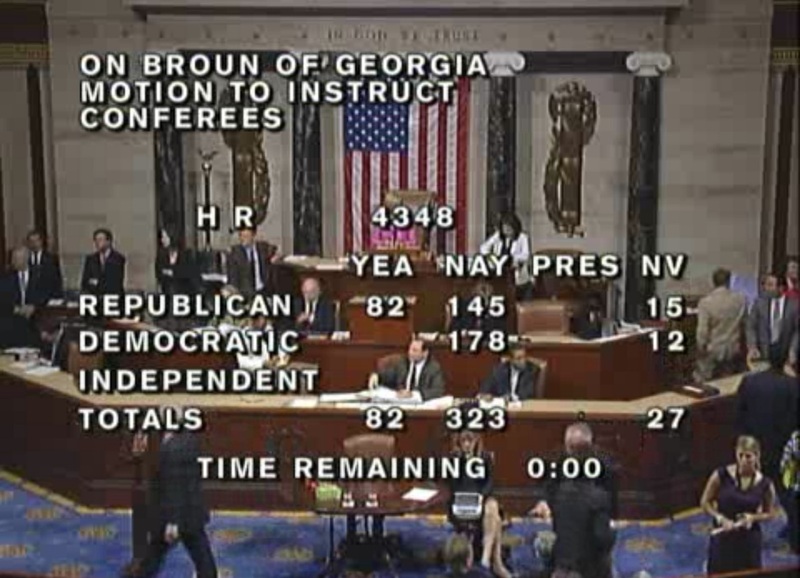 The motion, sponsored by Georgia Republican Paul Broun, had acheived “key vote” status from conservative groups FreedomWorks and the Heritage Foundation, and got a stamp of approval from the right-wing bloggers at RedState for good measure. Its failure represents a glimmer of hope that the Tea Party has not completely hijacked the transportation reauthorization process from the conference committee. It also hints at how the Senate’s transportation bill could have fared in the House, had it only been brought to a vote. And, like so many storylines of the last two years, it reflects the deep divisions remaining in the Republican caucus. As with all other motions to instruct conferees, this one would have been entirely non-binding. However, it put the House on the record about one of the most controversial aspects of the Senate’s proposed two-year 18-month 15-month transportation bill, potentially forcing an already precarious and contentious process into a delicate situation. Furthermore, while it’s true that the 82 Republicans who supported the motion represent a minority of the GOP delegation, that is little comfort when it has often seemed that House leadership would not bring any bill to a general vote unless they were confident it would pass with 218 Republican votes. The lesson here is that more Democrats and Republicans agree on more of the transportation bill than they’re leading us to believe. If the House GOP leadership had been willing to engage in a little coalition building, we’d probably have a bill passed months ago. Heritage and Club for Growth were scoring this vote, too—making it an even bigger deal that it failed. That is a massive failure for the vote to be that stacked even their own party voted against it. Chamber was scoring it on the other side, which explains the split. And the cut would have been closer to 98%, not 30% since it limited outlays. I could no longer afford a car so I sold it to pay off one of the ruthless big banks. Now I walk and take the bus. The bus system in my city is in high demand and that demand is increasing. So no more fu%#ing transportation cuts from you selfish rich loving pricks. I’m the 99% and I won’t be silent and I won’t go away. I choose to fight intelligently and not be passive. I’m liberal and proud so FU to the Koch Tea Party thugs. Could Transportation Spending Become a Core Conservative Value?